Posted on November 17, 2016, in liturgy and tagged ad orientem, Anne Roche Muggeridge, restore the sacred, the desolate city. Bookmark the permalink. 5 Comments. 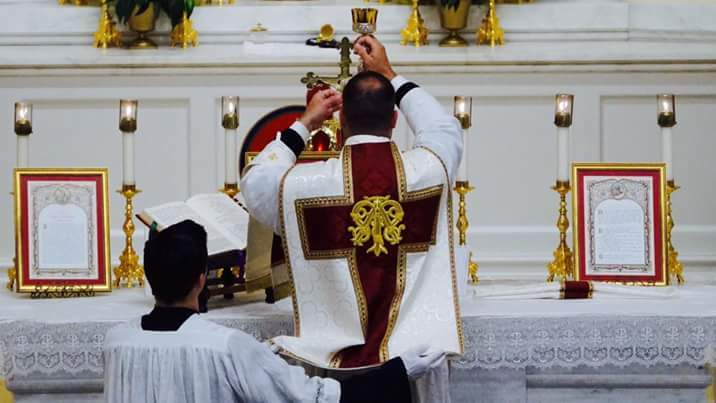 “Quickest Way to Restore the Sacred”: All Catholics should only attend FSSP or other EF parishes. In our church the priest is not only facing the people, but looking straight out of the glass doors at the west end at the buses coming up past the railway station. She mentions the use of a microphone. Is ad orientem typically done with or without a mic? Great question. I suppose it could be at times, but she is more specifically referencing the silent prayers of the priest, most particularly during the Canon of the Mass when he “enters into the cloud” (as Gueranger described it) and speaks to God the Father. The alcove architecture of most pre-Vatican II church sanctuaries allowed for natural amplification. The sound of the priest’s voice hitting the back wall of the alcove amplified the sound. I learned this by accident while rehearsing some music in an old church sanctuary.